Welcome to Jack the Hat’s digiscoping page. Here we will explain what digiscoping is and how you can set yourself up in this unique form of telephotography. The concept behind digiscoping is a simple one. It is the art of taking telephoto style pictures through a telescope/spotting scope with the aid of a digital camera in conjunction with an adapter to join the two together. The combination of the magnifications of the camera & spotting scope can produce incredibly detailed pictures of almost anything. Effectively, digiscoping is a means of trying telephotography at a fraction of the cost of a conventional style telephoto set up. It goes without saying that there are drawbacks. For example a spotting scope will never achieve the light gathering capability of an expensive telephoto lens, but this is why a conventional lens would cost so much more money. For example, the latest Canon 600mm f4L telephoto lens costs in the region of £11,000. Digiscoping though, makes telephotography a real possibility for anybody as the photos below illustrate. The pictures above speak for themselves. It is clear to see the capabilities of the camera and scope combination. So, if you have read this far you may be wondering what kind of equipment is needed. You will need a digital camera - either a standard digital compact camera or a DSLR (compact digital cameras are more popular for beginners), a spotting scope & eyepiece, a means of joining the camera to the scope, and a tripod. Most scope manufacturers can provide an adapter tube that fits to the scope leaving a male thread exposed for attaching a camera (This thread is commonly 42mm, sometimes called a T or T2 thread). Once you have the adapter for your scope you need to figure out how to connect your camera to the adapter. There are many different ways to connect a camera to a spotting scope. Here are a couple of examples of how to do this. 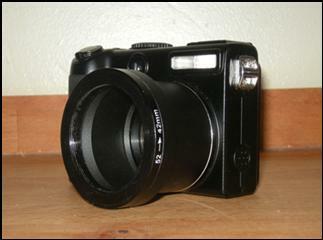 In the photo on the left we can see that an adapter tube has been fitted to the compact camera which allows the lens to move and function normally (be aware that some compact cameras do not have the facility to attach an extension tube so make sure you check this before buying your camera). On the end of the adapter tube is a female thread (in this case it is a 52mm thread.) To enable this 52mm female thread to successfully attach to the male 42mm (T2) thread of the spotting scope's adapter we have added one of our 52mm - 42mm (T2) stepping rings. Stepping rings are a very common component in digiscoping set ups. In the picture on the right we can see the stepping ring on the far left. This then attaches to the adapter. 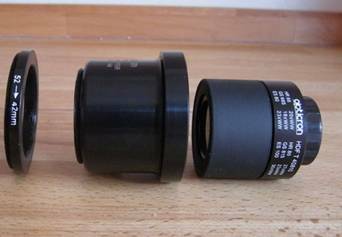 If your compact camera cannot accept an extension tube and doesn't have a filter thread around the lens then there are universal adapters available on the market which are designed to fit around the outside of the scopes eyepiece (see example 2 below). Below you can see the finished set up with the camera securely attached to the spotting scope. If your compact camera does not have the facility to use an extension tube and does not have a threaded part on the front of the lens then this method is your only sensible option that doesn't involve gaffer tape, toilet roll tubes and other hillbilly solutions. There are universal digiscoping adapters available that will work with just about any camera but make sure the adapter will fit your scope first!. These adapters attach around the eyepiece, with the camera mounted on the back. The adapter then adjusts to allow the camera lens to align with the eyepiece of the scope. The great thing about these adapters is the way they keep the camera and scope aligned. This is important as constant fiddling with your equipment can be a distraction in the field. 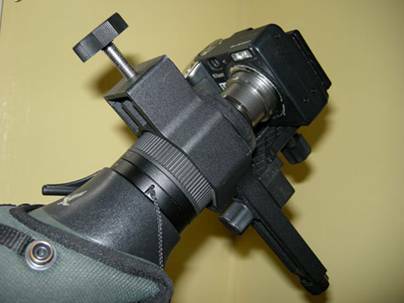 When it comes to digiscoping with a DSLR, most optic manufacturers make a specialist adapter. 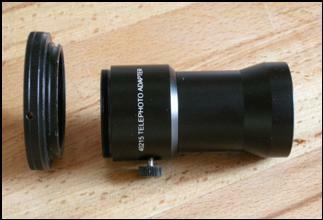 These adapters take the place of the scopes eyepiece, such as the Swarovski TLS800 or Opticron 40125. Below you can see a DSLR style telephoto adapter with one of our T2 mounts on the left of the photo. These commonly fit onto the scope in place of the eyepiece. Above we can see a DSLR style camera connected to a scope via the manufacturer’s adapter and one of our T2 mounts. There are other solutions for connecting a DSLR to your scope, such as a direct connection to the scope just using a T2 adapter, or by using a specialist bracket, such as the Swarovski UCA. 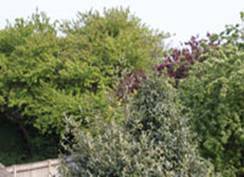 Digiscoping with a compact camera will more often than not produce vignetting (darkening of the corners of the image or, in extreme cases, a totally round image with a black border). This is usually cured simply by zooming in using the cameras zoom feature. In the photo below you can see a classic case of severe vignetting. Zooming in usually cures this. A compact camera with a 7-24mm lens generally works best for digiscoping. With DSLR digiscoping, the scope actually becomes the lens, and therefore vignetting is rarely a problem. There is of course much more to digiscoping. Getting set up is just the beginning. Below is some more information to bear in mind. A good compact camera will make life much easier. Photography is all about judging the conditions, and trying to set up your camera to perform to its best. Choosing a camera with a full manual mode is generally best (you can digiscope with practically any compact camera though so don’t worry!) as the camera can be adjusted to suit conditions better than if the camera just had an “auto” mode. Our advice here though is to try first with the compact camera that you may already own, from here one can gauge if digiscoping is for you without spending extra cash! 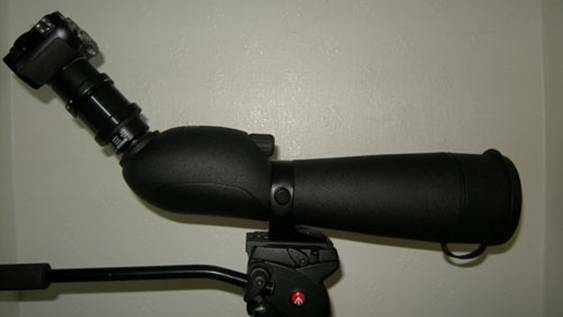 A mid priced scope will be fine to start your digiscoping career. A scope with ED glass (sometimes HD) will work better, however it is not essential. A scope with an objective lens (the big lens!) of 80mm is better than a 65mm version. The bigger objective will help to gather more light, which is very important to any photographer. Also a scope with a short minimum focus (less than 5 metres) distance can be an advantage, but again not essential. 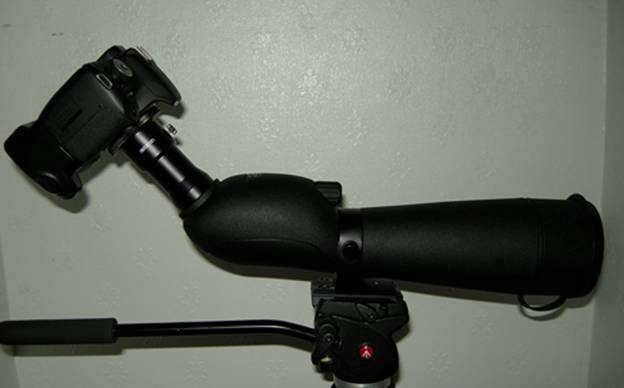 The tripod head is possibly one of the most important parts of your set up. A traditional tripod head will do a job for you, but for extra support and smooth manoeuvrability, with much more precise alignment control then a fluid filled tripod head or good quality ball head is a must. As you will find out, fixing on the subject is so important, so it’s vital that you can do this easily. A lightweight tripod makes transport around reserves much more civilised, but again is not essential to start off with. Keep the scope zoom setting on 20-25x at most. A fluid tripod head or ball head will work much better than a conventional screw fixed head. Keep it cost effective until you’re confident! So, how do I take pictures using a compact camera? The camera lens needs to be aligned with the scopes eyepiece to be able to take pictures. 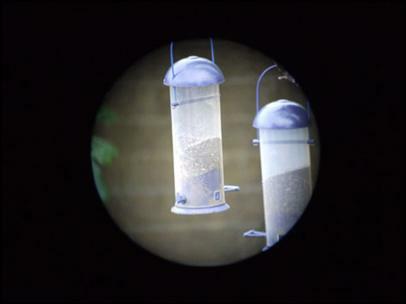 This can be achieved by mounting the camera on an adapter which aligns the camera lens with the eyepiece. The camera and scope set up is then mounted on a tripod to keep things steady. This is the most important part of the set up procedure. Poor alignment leads to poor pictures! Simply attach the universal adapter to the eyepiece of the scope, and then attach your camera using the threaded mount on the bottom. If your camera has extendable lens keep it as far from the eyepiece as possible at this point so that the lens can extend safely without risking damage to the lens or eyepiece. Now turn the camera on and adjust the adapter to bring the camera lens and scope eyepiece in to alignment with each other. 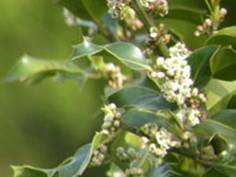 Make sure you get the cameras lens as close to the eyepiece as is safely possible. When perfectly aligned you will see a circle of light with a large black surround (like looking down a tunnel) on the cameras LCD display. This is called “vignetting” and is common when digiscoping with a compact. There is an easy cure to this. Simply zoom in! As the field of view is shortened the black area disappears leaving an image of whatever the point of focus is on the LCD display. So once all is aligned it's picture taking time! This is the part we all like the most, so here are some pointers for taking your first pictures. Start out in a hide or in your garden, this makes digiscoping with a compact camera much less frustrating as it is easier to see the LCD screen. Try to pick a bright day with little or no wind. Make sure the sun is behind you! Make sure the scope eyepiece magnification is 20-25x, turn on your camera, zoom in to alleviate vignetting, and find a subject. To start, pick a reasonably stationary subject. Use auto mode and make sure you turn off the flash! Once you have the camera locked on to the subject, focus the scope (not the camera) until the image becomes focussed on the LCD screen, then auto focus the camera (usually achieved by half depressing the shutter button). When the camera is focussed, fully depress the shutter button to take the picture, and hey presto, you’re digiscoping!! Camera shake can ruin pictures. Using the self timer will help when you are more confident. Less contact = Less shake. LCD screens are difficult to see in sunlight. Consider using a shade to help. Once you have confidence, try using full manual mode to enhance your cameras ability. In low light your camera's ISO can be increased to help lagging shutter speeds. No one gets a perfect picture every time. Expect plenty of poor pictures, its natural! Wind + Digiscoping = Hard work! Digiscoping is a wonderful hobby that can help you to capture nature’s beauty forever. Getting through the early frustrations is the key to success with digiscoping. It is not an easy technique to master, but with plenty of practice and patience great results are possible. Fortunately, the lower set up costs make this hobby accessible to all, and as most birders already have a scope and camera then it really is something that can be tried out! Better equipment can produce better results, but this is a consideration after you have gained some experience. This article was compiled in good faith with HUGE assistance from Daniel Porter of DANNY'S DIGISCOPING for Jack the Hat Photographic. Both photographs and text are protected by copyright. You are welcome to link to this page but copying and/or redistribution of this information elsewhere will result in legal action to protect our intellectual property rights. You have been warned!